DAC - Digital to analog convertor. | DSP - Digital signal processsor. 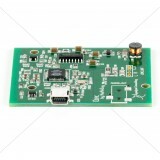 | SBC - Single Board Computer. Allo - Vana Player - Bundle Overview: This is the Vana Player. Includes Sparky + Kali + ..
Allo - Boss + Volt (Bundle) Overview: This is the BOSS + Volt Bundle. By purchasing this bundl..
ALLO - BOSS - DAC Overview: We all live in a society obsessed by brand names and the latest ga..
Allo - Boss - I2s - Dac - V1.2 Overview: We all live in a society obsessed by brand names and ..
ALLO - CAPACITANCE MULTIPLIER - Stand Alone Overview: A Capacitance Multiplier is designed to ..
ALLO - CHEAPO - S/PDIF Out + Headphone Amplifier Overview: Add the Cheapo with S/PDIF Shield t..
Allo - Digione Overview: First... What is a “Transporter” Basically you have yo..
Allo - Digione Player Overview: This is the DigiOne Player. Includes DigiOne + RPI3 + Acrylic ..
Allo - Isolator Overview: Full galvanic isolator between SBC/DAC. Unit will work on both maste..
ALLO - KALI - RECLOCKER Overview: Kali The Goddess of Time Every SBC has a crystal that it us..
Allo - MiniBOSS - DAC FOR RPI Zero Overview: There are many DACs for RPI Zero. Most of them lo..
ALLO - PIANO 2.1 HI-FI - DAC Overview: Piano can work as a 2.0 (all frequencies are passe..
ALLO - PIANO HI-FI - DAC Overview: Our PIANO Hi-Fi DAC Shield has been designed for those seek..
ALLO - SPARKY SBC - Motherboard Overview: Sparky Single Board Computer (SBC) is a credit card-..
Allo - USBridge Overview: First... What is a “Transporter” Basically you have y..